One of the drawbacks of aging is that your balance becomes poorer. Shortly after my 77th birthday I had 3 coming-to-a-stop/low-speed tip overs within a month on my CB500X. I'm a tad under 5'6" and have a 28" inseam, so I can only get one foot down to support that bike. As I no longer know which way it is going to tip, I cannot safely ride it anymore. I've put over 15K miles on it, almost all trail riding, but now it becomes my general purpose bike. Its seat is narrower, front springs are softer, and I can flat-foot this bike. It's about whatever keeps you the saddle! Glad to hear it man! I know you liked that 500 but yeah it's heavy in comparison. 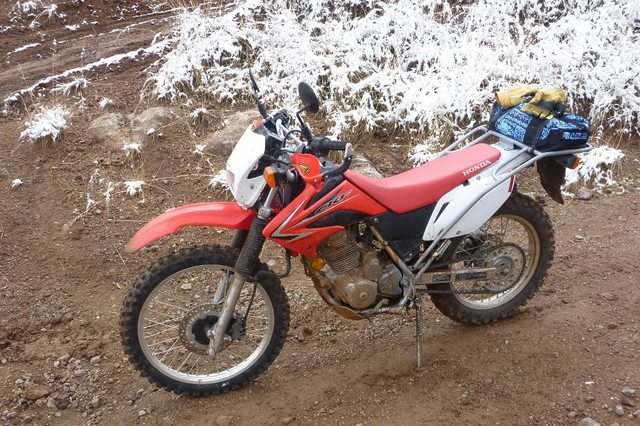 In my 20's-30's I had a Yamaha DT125 and a XT250, both were dual purpose and I went just about everywhere with them. These bikes work for young & old, err, older! (Count me in old, I'm 62 this month). I gave up my 650 Deauville in July 2017 because of the problems that come with age and top heavy bikes. At some junctions it could be a bit iffy. That's why I got a CBR300R instead. Lost 100 kilo straight off. I think the CBR will keep me going for many years. I'm 80 in a couple of months. Im not even that old but I dont like the idea of wrestling around with a >400 lb behemoth. For me the weight and flickability of the CB300F are a perfect fit. Also lately I notice I have been behaving like a squid. Alot of illegal lane splitting and lane filtering and even driving up the sidewalk to go around congested traffic so I can say form my personality that a bigger bike would be "just enough rope to hang myself with". I mean Im already driving like a jack-aass on the CB300F so just imagine me on a 600. I know exactly what you mean! In Jan. Of 2017, I saw an ad for a 2014 700x with only a little over 4,000 miles on it, for only 4K dollars and I just couldn’t pass it up. I had been thinking l should do something about my wonderful little cbr, before it gave up the ghost, now @127,000+ miles, but I couldn’t find a decent price on a 300, so I bought it. I absolutely love riding it and it takes half as much time to check the valves as the CBR, but boy is it heavy!! I know it’s only a matter of time until I drop it, but I’ll keep riding it as long as I can, l just turned 81 last month, and I can feel myself getting weaker all the time! The little cbr gave me a little fright this morning, I hadn’t ridden it for 2 weeks, the longest its ever sat since new and it was very slow to fire. I suspect the compression is getting a bit low, because the starter was really spinning it over fast. That little thing owes me nothing, but I’ll be very sad when it gives up the ghost!! Take Care & ride safe!